Home World U.S. News Northeast blizzard 2015: Why did forecasters get it wrong? According to several independent meteorologists, National Weather Service experts misjudged the path and impact of the blizzard that struck the Northeast on January 26 and 27, in large part because they trusted the wrong forecasting model. 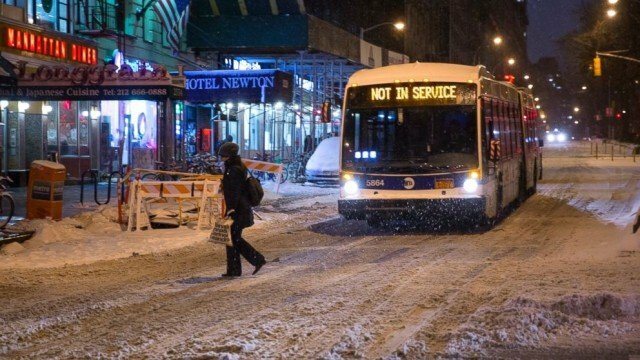 Rather than rely on their own forecasting system—upgraded in recent weeks—the federal experts placed their faith instead on a well-regarded European computer model that predicted the worst of this storm would squarely hit New York City. That system earlier had outperformed the US forecasting system in predicting the path of superstorm Sandy. This time, the European forecasting model was wrong, several commercial forecasters said. That model, one of four complex computer simulations normally used to calculate weather patterns along the Eastern seaboard, predicted that the heaviest snow would fall between 50 and 100 miles farther west than actually occurred. As predicted, the storm pounded parts of Long Island, Connecticut, Rhode Island, Massachusetts and Maine, with winds in excess of 50 mph and snow in some locales up to 30 in deep. The National Weather Service had recently improved its own system, called the Global Forecast System, and its forecast correctly predicted that the storm would go farther out to sea, away from New York City.